long with the rest of America, the American Catholic Church has undergone a major shift in its demographics over the past several decades. As of 2014, at least 42 percent of American Catholics are people of color. Every Sunday in America, Mass is celebrated in dozens of languages, and American Catholics are increasingly diverse in their racial and ethnic heritages, skin color, and perceptions of life and ways of celebrating their Catholic faith. It would appear that the cultural diversity that the Church is experiencing is a direct reflection of Saint Paul’s words to the Galatians, “There is neither Jew nor Greek, there is neither slave nor free person, there is not male and female; for you are all one in Christ Jesus.” We are seeing the emergence of a universal Catholic community composed of a diverse demographic from across America. Many Catholics point to this unity as a sign of the power of grace to bring people together. Bryan Massingale, explains Cone’s comments. “[Cone’s] contention is that there are critical faults and deficits in Catholic reflection on racism. He adduces this from an apparent disparity between Catholic concern regarding issues, such as poverty and the sanctity of life, when compared to the Church’s peripheral attention given to the endemic racism of American society.” If one conducts an honest observation of the Catholic Church in North America, one will easily come to realize the American Catholic community, in general, still has a long way to go to realize the racial harmony that the demographics appear to display. As the new millennium approaches, there remains another great challenge facing this community…[and] the whole country: to put an end to every form of racism, a plague which…[is] one of the most persistent and destructive evils of the nation. The fact that such a network, renowned for its orthodoxy could make such a statement and lack any conviction in the pope’s challenge demonstrates that standing against racism is both not a major marker of Catholic identity, and more importantly, not recognized as a major issue in America. Tragically, this is but one instance that serves to show that in America, the Catholic imagination is socially crippled and unaware of the persistent evil of racism. One of the challenges present in addressing racism is that the terminology used to refer to the various issues that revolve around race is fluid, evolving, contested, and never emotionally neutral. Terms such as “people of color”, “minority”, and even “race” are troublesome terms due to their sometimes varied and ambiguous uses. For example, in the general vernacular, “people of color” or “nonwhites” are collective terms that refer to all racial and ethnic groups that are not part of the socially dominant cultural group. These terms are used in the place of proper social-political constructs; not as scientific or anthropological terms. Stated another way, while these terms make reference to skin color, they refer much more to social groups that, for the most part, find themselves without easy access to the political, economic, or social advantages enjoyed by the majority of the population—in most cases those designated as “white” people. One of the obvious manifestations of racism is what I call “conscious” racism. This type of racism focuses on interpersonal behaviors or deliberate actions, performed by either an individual or the collective effort of a relatively small group, that intentionally chooses to act in a negative manner towards another race. This form of racism that society experiences is intuitively not a part of the Church’s understanding of how to interact among persons of different races or nationalities. According to Christian teaching, the Creator lovingly “created man in his image, in the divine image he created him; male and female he created them” (Gen. 1.27). The human race is rooted in the loving, creative act of God, who made us and called us to be a family, one human family, made in God’s image and likeness. There is no basis to sustain that some are made more in the image of God than others. In whatever form, intolerance of other people because of their race or nationality is the denial of human dignity. One race is not better than another person because of the color of their skin or the place of their birth. What makes us equal before God, and what should make us equal in dignity before each other, is that we are all sisters and brothers of one another, because we are all children of the same loving God who brought us into being. Therefore, the practice of this “conscious” racism denies the basic equality and dignity of all people before God and one another. Although America has moved forward in a number of ways against this form of racial discrimination, there remains an undercurrent of racism throughout the nation; mirrored by those associated with the Church. Jesus asserts, “I say to you, whoever is angry with his brother will be liable to judgment…and whoever says, ‘You fool,’ will be liable to fiery Gehenna.” Jesus could not have been more direct. If we hope to offer ourselves to God, to live a Christian life in accord with his plan, it cannot be done with disdain or disregard for others—including those of other races—in our hearts. And if we determine that there are those who have such conscious disdain for others, it falls upon the Church to tirelessly combat such inclinations. As Paul tells us, “God has reconciled the world to himself in Christ… entrusting to us the message of reconciliation.” Therefore, the Church is not finished with the work given it to protect and uphold the dignity of each and every person. This leads us to consider and acknowledge a more sinister form of racism: “unconscious” racism. This manifestation of racism is much more complex, difficult to pinpoint, and, unfortunately, has entangled itself into the very fabric of our nation’s social institutions, and in various degrees, crept into some of our beloved Church structures. Regardless of how vividly “conscious” racism expresses itself, whether that be blatantly public or concealed in the recesses of one’s heart, it does not explain the persistence of the continuation of our nation’s infatuation with race within our culture. Despite undeniable changes to civil laws and social policies, there remains an underlying dynamic that remains impervious to civil laws, equal opportunity mandates, and even the election of an African American president. What is this cultural phenomenon that lives on in the spirit of American society despite observable changes in civil law. Regarding the Church, what is the underlying spirit that has infiltrated the Church in the face of an undiluted condemnation of racism by our Christian tradition? Hence, culture is not primarily a way of acting, but a way of being and ascribing meaning to a way of life. Culture provides the ideological foundation for social, political, and economic policies that enable the community to function in the world. In other words, culture is the spirit that animates social institutions and customs, makes them intelligible, and expresses their meaning and significance. In America, “racism functions as a culture, that is, a set of shared beliefs and assumptions that undergirds the economic, social, and political disparities experienced by different racial groups.” Understanding culture in this way enables us to get beyond “conscious” racism and better understand its systemic tenacity, which makes many succumb to racism inadvertently. In America, the set of meanings and values provides the ideological foundation for a racialized society, where society’s benefits and burdens are inequitably allotted among the various racial groups. American culture, then, not only answers questions about the development of social patterns, but also provides evidence that the culture is also formative. This racialized culture produces an “unconscious” racism. Put more simply, because a racialized set of meanings and values permeates all of our social cultural products—education, justice system, health care access, wealth systems, etc.—we learn our cultural “racial code” almost tacitly through our everyday process of socialization and learning how to be a “good American”. This coding functions beneath our conscious awareness. This is why even an institution, like the well-meaning Church, can still appear to be indifferent or silent in the presence of systemic racism. Now that we have a better understanding of what is racism in America; namely, its conscious and unconscious elements, we can better evaluate the Church’s previous responses to this crisis. At significant times in American history, the Church has written pastoral letters of concern over the sin of racism. 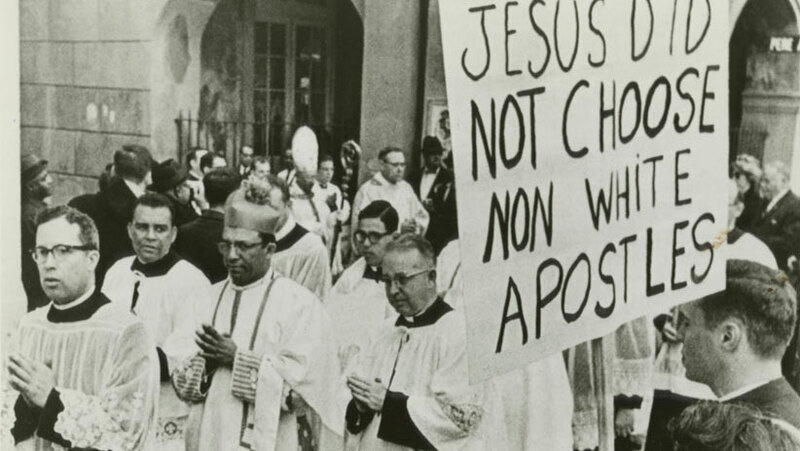 In 1958, the bishops wrote Discrimination and Christian Conscience to condemn the blatant forms of racism found in segregation and the “Jim Crow” laws. Ten years later in the spring of 1968, the bishops again penned a letter entitled National Race Crisis to condemn the scandal of racism and the policies which led to violence that erupted in many major cities across the nation. Then again, in 1979, the bishops wrote Brothers and Sisters to Us, a pastoral letter addressing how racism was still affecting so many, highlighting the structural and institutional forms of racial injustice evident in the economic imbalances found in our society. These three documents directly addressed issues concerning race within our nation’s borders over a relatively short period of time. It demonstrates that during the turbulent sixties and seventies the American Church was aware of the persistent evil of racism. However, along with the strong words of condemnation of racism found among its pages, there was shortcomings. For nearly the first fifty-five years of the twentieth century, unequal treatment between blacks and whites was mandated even in the most ordinary circumstances of life; including eating at restaurants, visiting parks, or using public transportation. Overt racism was also evident in the political and social climate. Fear of physical violence and retaliation from white supremacist groups kept the majority of the black population from registering to vote. Black representation in law and medicine was either inadequate or completely nonexistent. “Block busting” and other racial steering techniques were uses to ensure that segregated housing patterns were the norm. This all began to change by a watershed moment in the spring of 1954. With this decision, an era of attempts to crack the system of segregation began in earnest. Though the decision only directly addressed education, it provided the stimulus to challenge the prejudicial and discriminatory attitudes, customs, and behaviors, protected and favored by law. An increase in demonstrations, boycotts, and civil disobedience began to play out in the public square. It was as a result of this decision that Martin Luther King, Jr. felt empowered to implement his nonviolent methods of economic boycotts that achieved the desegregation of the Montgomery buses. It was this decision that inspired African American college students to stage a sit-in at lunch counters throughout Greensboro, North Carolina. It was in this context of a nation wrestling with the challenge of desegregation, increasing civil rights protests, and the unsettling of longstanding cultural customs that the American bishops issued the first pastoral letter to directly address the issue of race in American, Discrimination and Christian Conscience. In this letter, the bishops articulated their concern that the “transcendent moral issues” involved in the quest for racial justice and equality had been forgotten. The document states, “The time has come… to cut through the maze of secondary or less essential issues and to come to the heart of the problem. The heart of the problem is moral and religious.” The bishops’ intention was to address the moral and religious aspects of racism. In particular, the need for an individual to have a personal conversion; specifically, a change of “poisoned” attitudes toward people of color. The document outlines four doctrinal foundations upon which the bishops grounded their moral assertions regarding segregation. First, the “universal love of God”, demonstrated fully in the death of Jesus, is intended for “all mankind.” Second, Jesus’ mandate to love one’s neighbor and to “teach all nations,” implies that all persons are brothers and sisters in Christ. Thirdly, the intrinsic universality of the Christian faith “knows not the distinctions of race, color, or nationhood.” Lastly, the natural moral law “that God has implanted in the souls of all men,” teaches that each human being “has an equal right to life, to justice…and to equitable opportunity to use the goods of this earth for his needs.” Upon these foundations the bishops established that enforced segregation could not be reconciled with the Christian view of the human person. In a lot of ways Discrimination and Christian Conscience, is truly a landmark document in the history of the Catholic Church in America. The letter asserts the equality of all peoples in the sight of God; including the African American. In addition, it reminds Catholics of their obligation to love all fellow human beings. As the letter states, this is not “a matter of emotional likes or dislikes…but a firm purpose to do good to all men.” However, despite these landmark assertions, the document had little secular or ecclesial significance. One of the reasons for this is due to the tardiness of the Catholic Church’s response; namely, four years after the Supreme Court’s decision. All other mainline Christian bodies had issued statements by the beginning of 1957, with some issuing statements as early as 1954. Furthermore, the document makes no specific recommendations or proposals for action. Though the document called upon all to act “courageously, and prayerfully”, it simultaneously deplored “rash impetuosity” that leads to “ill-timed and ill-considered ventures.” Rather, it suggested a “quiet conciliation”, no concrete or bold call to action. When compared to their Protestant counterparts, the Catholic response was shockingly superficial and lacked any specificity. Whereas “Protestant statements tended to be more concrete, call for support of the Supreme Court decision, the integration of church facilities… explicit condemnations of the Ku Klux Klan, White Citizens Council…and lawless attacks on integration efforts.” None of these are even mentioned in the bishop’s document. Despite their judgment that compulsory segregation was incompatible with Christian beliefs, there was no call to desegregate Catholic facilities or fraternities. The probable explanation for both this tardiness and lack of specificity is that this document was issued reluctantly under pressure from the Vatican and against the objections of leading American Catholic authorities. Massingale reports, “Rome was insist that the bishops issue a letter on racism…the day before he died Pope Pius XII sent a cablegram ‘ordering the American bishops to issue the statement at once.’” This illustrates what has proven to be a recurring dynamic in the imagination of the Catholic Church in America; while the Vatican has been more vigilant, concerned, and forthright regarding racial injustice and willing to confront racial inequality in America, America’s own clerical leaders have yet to muster such courage. If we shift our attention to ten years later to the document The National Race Crisis, we read within the document, “It is evident that we did not do enough; we have much more to do…It became clear that we failed to change the attitudes of many believers.” As this quote indicates, the bishops realized that their previous document did not do what it had been intended. Throughout the increasing activity of the Civil Rights Movement following the Brown v. Topeka Board of Education decision, the Church found herself either uninvolved in the social turmoil of the nation, or worse yet, standing in opposition to those campaigning for universal civil rights. For example, during the civil rights demonstrations in Birmingham, Alabama in 1963, a letter addressed to Martin Luther King, Jr. entitled “A Call for Unity,” expressed the words of eight white Birmingham clergymen who denounced King’s civil rights organization and labeled the demonstrators as outsiders seeking to destroy the racial harmony of the city. Though acknowledging the grievances of blacks, and that everyone deserved basic human respect, the authors asked blacks to accept the racial situation for the time being. One of the authors was Joseph E. Durick, Auxiliary Bishop of the Catholic Diocese of Mobile, Alabama. By signing the open letter to the civil rights leader, Durick demonstrated the position of the Alabama Catholic Church leadership during the movement. The state Archbishop, Thomas J. Toole, denied priests the right to participate in demonstrations or speak out against racial segregation. The clergy appeared to uphold human rights in theory, but refused to give legitimacy to protesters, such as King, who broke prevailing state segregation laws. As a result, most Catholic parishes remained segregated along racial lines. Within these parishes there tended to be no set standard for segregation inside parishes. Some dioceses created separate parishes for blacks, though that was not always the case. In many areas, blacks could attend any Catholic Church, but there was usually some degree of racial separation. In New Orleans, for example, blacks had to sit in the rear pews, and unable to receive communion until every white parishioner had been served. Some parishes also placed screens between the two races. In addition, in 1967, Pope Paul VI asserted in Populorum progression, that the Church must work to address social inequities by “building a human community where men and women can live truly human lives, free from discrimination on account of race, religion or nationality.” Not wanting to be “ordered” to respond to this persistent issue, the bishops penned The National Race Crisis in 1968. Unlike its predecessor, in response to the papal decree, the civil crisis that the nation faced, and to the voices among the black Catholic faithful, the document urgently calls for the faithful to act decisively. The document advances the positions taken in the previous document. It contains an explicit acknowledgment of Catholic culpability in the increasing racial crisis. The document states, “Catholics, like the rest of American society, must recognize their responsibility for allowing these conditions to persist.” Furthermore, the document takes a much broader view of the problem of racism. It recognizes that racist attitudes and behaviors “exists not only in the hearts of men, but in the fabric of their institutions.” Thus, a concern is shown not just for individual race prejudice but for institutional racism as well. Unlike its predecessor, this document makes several concrete recommendations for action. Bishops called for the “total eradication of any elements of discrimination in our parishes, schools, hospitals, and homes for the aged.” Dioceses too were urged to establish similar programs on the local level. However, despite these significant advances that this document made over the previous letter, it nonetheless did not have the result that was intended. While further research is needed to confirm exactly why this is the case, printed media of the time can shed some light on why the document was so ineffective. In an editorial entitled “B Plus for Effort” the National Catholic Reporter called the bishops’ priorities “dubious” in light of the fact that the proposals offered in the document only secured $28,000; as compared to several hundred thousand for proposals concerning the study of clerical concerns and $2.2 million dollars awarded to Catholic University of America. In addition, Newsweek provided detailed coverage of the document’s proposals. It also reported the “strong dissatisfaction” of the African American priests with the document’s recommendations. The most significant development that resulted from the era of this document was the creation of several black Catholic groups within the Church. In addition to the National Black Catholic Caucus, the National Black Sisters’ Conference, the National Black Lay Caucus, and the National Black Seminarians Association came into existence during this time in an attempt to voice black concerns, advocate for black Catholic social issues, and insure the inclusion of the black Catholic experience. Nevertheless, ten years later the American bishops found themselves again having to address the issue of racism both among the general populace and within the walls of the Church. The structures of our society are subtly racist…they are geared to the success of the majority and the failure of the minority….the sin is social in nature that each of us, in varying degrees, is responsible…we must resist and undo injustices we have not caused, lest we become bystanders who tacitly endorse evil. Like the 1968 document, this pastoral letter gave specific guidelines for action, but also went beyond its predecessor by making more concrete and detailed suggestions. The document outlines three distinct ways to counteract racism; namely, personal, ecclesial, and societal. Regarding the personal and ecclesial call to action, the document exhorts individuals to reject racial slurs, stereotypes, and jokes, and to be mindful of ways in which social structures inhibit the advancement of people of color. The Church herself was called to insure her parishes became places of welcome and inclusion, develop liturgies that respect and foster the gifts of various races, and implement an effective affirmative action program that would increase the vocations among people of color. As a result of the words of the document, some advancements were made. There was an increase in black men being ordained to the episcopacy, many dioceses and religious communities increased their efforts to recruit men and women into the priesthood and into religious life, and efforts were made to encourage liturgical adaptions to include cultural heritage of communities of color among the faithful. However, the publicity given this document was very limited. As a result, the promulgation of this pastoral letter was soon forgotten by all but a few. In 2004, twenty-five years after Brothers and Sisters to Us, the US Catholic Bishops commissioned a study to discern its implementation and reception. The commission’s results paint a disheartening picture of the Church’s relationship with communities of color. Since the Brothers and Sisters to Us was first promulgated, only 18 percent of the American bishops have issued statements condemning racism, and of those few address systemic or the “unconscious” racism found in our nation; rather, they address “conscious” racism, the personal attitudes of direct racial malice. 64 percent of Catholics had not heard a homily on racism or racial justice in the past three years. In other words, racism was not mentioned once over the entire three-year cycle of the Sunday lectionary in the majority of American Catholic churches. Furthermore, only 33 percent of dioceses have offices dedicated to multicultural ministries, and over half of these lack the financial resources needed for effective ministry. In fact, one-third of these offices report that the laity of color are “never” or “hardly ever” involved in planning or decision making for their communities. Most disturbing is the commission’s report that white Catholics “exhibit diminished—rather than increased—support of government policies aimed at curbing racial inequality.” These official statistics detail the significant lack of compliance by the Church with its own recommendations contained in her documents regarding racism. This prompts the question: Why is this the case? While the bishops and the leaders of the Church have clearly written that racism is contrary to Christian conviction and practice, why does it appear that there is so little social consciousness within the Church regarding racism? To begin, unlike other major teachings on social justice, the issues that revolve around racism are not informed by sustained social analysis. There is no evidence of a formal investigation into the phenomenon of racism. Unlike other pastoral letters of the same genre and era, such as Economic Justice for All and The Challenge of Peace, which incorporated sustained social and economic research to draw its conclusions, what has been written or taught concerning racism is largely uniformed by current social science and relevant research by race theorists, economists, and workers of public policy. This results in a teaching that does not persuade critical readers, especially those who do not share Christian presuppositions. In addition, the Church’s teaching on race in America has neglected or slighted the voices of the victims and failed to examine the issue from their perspective. There are currently 463 bishops and cardinals that make up the conference of bishops in America. Of those, only 9 (3 percent) are African American. The disproportionate leadership within the parishes are even more staggering. There are nearly 415,000 priests in America, with only 250 (less than 1 percent) of them being African American. As a result, the lack of adequate representation of African American leadership in the Church tends to orientate the Church’s racial justice tradition to speak about and for people of color, but it is not capable of acknowledging the independent thoughts, actions, or leadership of the black community. Most significantly, American Catholic social teaching on race suffers from a lack of passion. As a corporate body and as individuals, Catholics espouse a number of beliefs, but not all of these are held passionately. For example, no one can doubt the passion with which the Catholic Church opposes abortion. This position is articulated repeatedly and forcefully. Even in the face of opposition, Catholics hold its view about the sanctity of the life of the unborn fervently. Opposition to abortion is a major public marker; it is intrinsic to a Catholic’s identity. However, despite the bold words the leadership of the Church has penned regarding racism in its past pastoral letters, it is evident that racial justice is not a passionate matter for white American Catholics. As Massingale exhorts, “If ‘passion’ connotes commitment, involvement, and fervor, the Catholic stance on racism, in contrast, can be characterized as tepid, lukewarm, and half-hearted.” The US Bishop’s Committee on Black Catholics noted how Brothers and Sisters to Us aroused a “pathetic, anemic response” from most Catholics. Quite simply, standing against racism is just not considered an essential character of Catholic identity. Therefore, when viewed through the lens of the black Catholic experience, there are serious shortcomings in the approach of the American Catholic Church on racism. If the Church is to change the current lack of passion for issues revolving around racism, she will need to have a genuine conversion of the heart, a conversion that will motivate change. In order to do so, she must become consistent in her teaching and exhortations against racism. The Church must not only make a call to action but implement practices that result in concrete progress in its combat against racism. I propose three distinct actions to reform the racial attitudes in the American Catholic imagination. To begin, there must be an examination of sinfulness—individually and as an institution. It is only from a place of humility that the Church and its faithful can look honestly at past failures, ask for forgiveness, and move towards healing and reconciliation. This requires the Church to acknowledge sinful deeds and thoughts and to ask for forgiveness. I suggest the establishment of a Catholic Truth Commission to clearly study and analyze the Church’s contribution to the current racial attitudes that are prevalent in the recesses of the faithful and in her structures. Church leadership, then, can genuinely acknowledge that there have been many failures in truly living and acting as the Catholic tradition demands. Only through accurate social study of the Church’s connection to past indiscretions can she sincerely move toward reconciliation and restorative justice. Second, in order to work at ending racism, the Church needs to engage the world and encounter others who are on the peripheries of her own view. The Church must invite into dialogue those she ordinarily would not seek out. She must work to form relationships with those she regularly avoids or may never see at all. This demands all of her faithful to go beyond themselves, to open their minds and hearts to value and respect the experience of those who have been harmed by this sin. To foster such encounters, and to express her strong and renewed resolve to work for justice, Church leadership has formed an Ad Hoc Committee Against Racism. The Committee has already begun its work, beginning with preparing a new pastoral letter again addressing the issues concerning racism. However, unlike previous pastoral letters on race, along with this highly anticipated letter, the Committee will be conducting listening sessions, providing resources about racism, giving tools to dioceses, and parishes to begin important conversations about this sin, and exploring needed policy initiatives. Once the letter is released, the letter will be accompanied with links to supplemental information, stories, videos, etc. to provide the faithful with additional context for issues addressed in the letter. This approach will ensure that the Church connects with the modern reader and current modes of learning. Via this Committee, the Church is committed to implementing an ongoing national dialogue and encounter, as well as bring successful models and stories of hope to people at all levels. I propose, in conjunction with this letter, that all facets of the bishop’s conference be tasked to seek meaningful opportunities that deepen understanding, foster reconciliation, and publicly witness to the Church’s commitment to ending racism by implementing a Just Faith Program on Racism. “A change of heart cannot occur without strengthening spiritual convictions regarding respect for other races and ethnic groups.” The implementation of a Just Faith Program on Racism would instill into the formation and practice of the Church’s clergy, religious, and lay leadership an awareness of racism in America. The program can enforce in her seminaries, deacon formation programs, houses of formation, and her education institutions new and innovative ways to raise awareness, provide curriculum, and promote adequate incorporation of the history, culture, and traditions of all the people of faith, including persons of color in America. Lastly, in her parishes, priests, deacons, religious brothers and sisters, catechists, and parish staffs must commit to carrying forth the message of social charity and human dignity. The Church must ask her parishes to fight this evil of racism by educating themselves, listening to the experience of those who have been affected by racism, and in developing and supporting programs that help repair the damages caused by racial discrimination and prejudice on a local level. I propose priests and deacons commit to preaching homilies that regularly address issues concerning race and its impact on the homes and communities of the locals they shepherd. Furthermore, the Church must call her religious education programs, Catholic schools, university campuses to develop curriculum relating to racism and reconciliation. By developing and restructuring her houses of formation and instruction to increase the passion of the hearts of her leaders regarding issues of racism, as educators and pastors, the Church can better assist in increasing the social awareness of this issue to her families. Parish leadership can then urge each family to consider the dignity of others in the face of jokes, conversations, and complaints motivated by racial prejudice. Parents, in turn, can then provide experiences for their children that expose them to different cultures and people, altering their daily routines to broaden the Church’s own family social views. As a body of families, the Church can then draw upon the incredible diversity of the Church nationwide in providing education within the family and make clear that God dwells in the equal dignity of each person. Conversion is a long road to travel, for the individual, the institution, and even more so for a nation, but as a Christian faith, we need to trust that we can find the strength and the grace necessary to make the journey. In Christ, we live in a new reality where the divisions between people that lead to discrimination and hatred can no longer be tolerated. To combat the sin of racism, both “conscious” and “unconscious”, we are all in need of ongoing conversion. If racism is confronted by addressing its causes and the injustice it produces, then healing can occur. The Church must commit herself to specific actions with the hope that others in the nation will do likewise in their own lives and communities. In America, this is not a work the Church can accomplish alone. Therefore, she must join all efforts to repair the breach caused by racism. The Church must join all Christians and those of other faith traditions in this battle against that which damages the human family. In the nation’s past, ecumenical and interreligious cooperation has been pivotal at key moments in its history. That spirit is integral to this fight today and the Church’s success will be very much depending on such collaboration. Above all, the Church must place her confidence in the Lord, Christ Jesus. In Christ, we are all brothers and sisters to one another. Through Christ, we envision the new city of God, not built by human hands, but by the love of God poured out in Christ Jesus. On the journey to that “new heaven and new earth,” we make our way with faith in God’s grace, with hope in our own determination, with confidence in the workings of the Holy Spirit, and above all with love for each other as children of God. Phelps, Jamie T. “Communion Ecclesiology and Black Liberation Theology,” Theological Studies 61(200), 675-699. Massingale, Bryan. “James Cone and Recent Catholic Episcopal Teaching on Racism,” Theological Studies 61, 2000. Weurl, Donald. The Challenge of Racism Today, November, 2017: http://adw.org/2017/11/01/cardinal-wuerl-issues-pastoral-letter-racism; accessed April 12, 2018. National Catholic Reporter, April 24, 1968, 3. USCCB, “Discrimination and Christian Conscience”, Pastoral Letters of the United States Bishops, Volume II, 1941-1961. http://www.usccb.org/issues-and-action/cultural-diversity/african-american/resources/upload/Discrimination-Christian-Conscience-Nov-14-1958.pdf; accessed April 12, 2018. ______. “National Race Crisis”, Pastoral Letters of the United States Bishops, Volume III, 1962-1974, 156. http://www.usccb.org/issues-and-action/cultural-diversity/african-american/resources/upload/Statement-on-National-Race-Crisis-April-25-1968.pdf; accessed April 12, 2018. _______. Brothers and Sisters to Us, http://www.usccb.org/issues-and-action/cultural-diversity/african-american/brothers-and-sisters-to-us.cfm, accessed March 16, 2018. _______. Pontifical Commission on Justice and Peace, The Church and Racism: Toward a More Fraternal Society, 1988. Center for Applied Research in the Apostolate (CARA), Cultural Diversity in the Catholic Church in the United States, Washington DC: Georgetown University, 2014. http://www.usccb.org/issues-and-action/cultural-diversity/asian-pacific-islander/demographics/upload/CARA-Report-June-2014.pdf; accessed April 28, 2018. Bryan Massingale, “James Cone and Recent Catholic Episcopal Teaching on Racism,” Theological Studies 61 (2000), 700. John Paul II, Holy Father’s Papal Mass at the Trans World Dome, http://archstl.org/archives/page/holy-fathers-homily-papal-mass; accessed April 28, 2018. Bryan Massingale, Racial Justice and the Catholic Church, (Maryknoll, NY: Orbis Books, 2010), 46. In addition, it is important to note that in regard to the use of the term “minority community” or “minorities”, it is not consistently employed to mean a “numerical” minority, but rather carries the notion of power, privilege, or value. Donald Weurl, The Challenge of Racism Today, released November, 2017: http://adw.org/2017/11/01/cardinal-wuerl-issues-pastoral-letter-racism; accessed April 12, 2018. Bernard Lonergan, A Second Collection, edited by William F.J. Ryan and Bernard J. Terrell, (Philadelphia: Westminster Press, 1974), 232. 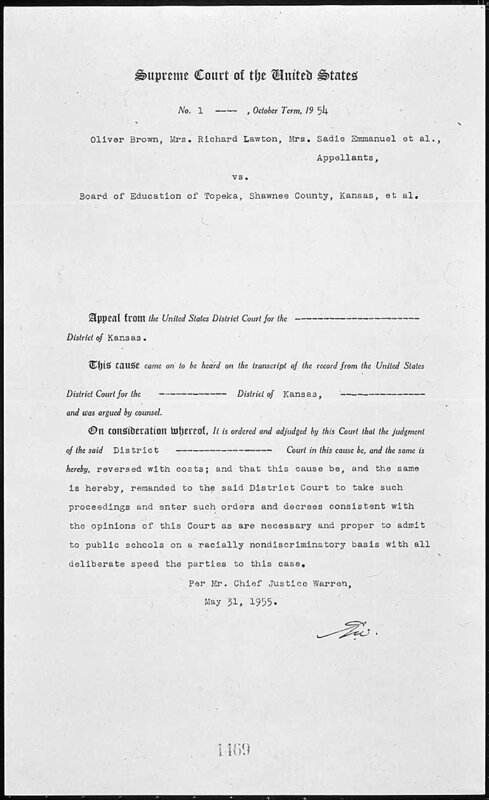 Brown v. Topeka Board of Education, https://www.archives.gov/files/education/lessons/brown-v-board/images/decision.jpg; accessed April 30, 2018. “Discrimination and Christian Conscience”, Pastoral Letters of the United States Bishops, Volume II, 1941-1961. 202. http://www.usccb.org/issues-and-action/cultural-diversity/african-american/resources/upload/Discrimination-Christian-Conscience-Nov-14-1958.pdf; accessed April 12, 2018. Massingale, Racial Justice and the Catholic Church, 54. “National Race Crisis”, Pastoral Letters of the United States Bishops, Volume III, 1962-1974, 156. http://www.usccb.org/issues-and-action/cultural-diversity/african-american/resources/upload/Statement-on-National-Race-Crisis-April-25-1968.pdf; accessed April 12, 2018. “The National Race Crisis”, 156. National Catholic Reporter, May 1, 1968, 3. Newsweek, May 6, 1968, 66. All quotes from Brothers and Sisters to Us where taken directly off USCCB website at http://www.usccb.org/issues-and-action/cultural-diversity/african-american/brothers-and-sisters-to-us.cfm, accessed March 16, 2018. In addition to the lack of promulgation, many black Catholics found offense in the very title of the document. By entitling the document Brothers and Sisters to Us, the Church made the white Catholic the “us”; thereby identifying being white and Catholic normative. Statistics taken from Bryan N. Massingale, Racial Injustice and the Catholic Church, (Maryknoll, New York: Orbis Books), 68-70. Bishop’s Committee on Black Catholics, For the Love of One Another: A Special Message on the Tenth Anniversary of Brothers and Sisters to Us. (September 1989). Francis, “Address to US Congress,” September 24, 2015.